Weird and wacky is right. Some of the photos look to be '70s vintage...what do you think? 50 Weird, Wacky and Wonderful Motorcycle Trikes - Part 1: "
Trikes by definition are strange or weird, since they are a crossing between a motorcycle and a car. Here are 50 photos of motorcycle trikes, part 1 of several parts. Why Obeying The Speed Limit Can Kill You: "
And you thought that by riding your motorcycle at the speed limit was safe! Not always. June 2009, a 79 year old driver, Andrew Cavanaugh, was driving his car through an intersection in Pinellas County, Florida. The posted speed limit is 25 mph, but the red lights were timed for passing through the intersection at 30 mph. In other words, just before the lights turn orange, you can safely cross the four lanes at 30 mph before the opposite lights turns green. Fire up your engines...sharpen your pencil! Last Friday's two-bike dilemma found yours truly double-booked with very different loaner motorcycles: the BMW F800R and the Harley-Davidson Blackline. The situation managed to solve itself thanks to my friends Levi* and Maria, both of whom were willing to come along and alternate between the Beemer, Hog, and Long Term Triumph Bonneville. At the end of the day, the saddle swapping effectively allowed me to have my two-wheeled cake and eat it, too-- which you can read about in this ride report. Got ride reports you'd like to share? Feel free to share your riding experiences in our new Readers Respond Feature, where you can tell tales about your ride, upload a photo, or just live vicariously through other readers' experiences. Open Roads, Warm Weather, and Two Very Different Bikes... Which Would You Pick? What Was Your Longest Motorcycle Ride? What Are Your Rules for Riding? Photo © Basem Wasef; click for ride report"
Important info. I had a rear tire going flat on an interstate entrance ramp at speed. It felt like the rear end was sliding out which was freaking me out. I pulled over and discovered the rear tire was losing air fast because of a nail. What to Do if You Get a Flat Tire on a Motorcycle: "
Suffering a flat tire on a motorcycle can be a stressful experience: if it happens at speed, that familiar connection to the road is suddenly lost, leaving you struggling for control as you try to keep your motorcycle upright. I recently suffered a flat (which I describe in this Triumph Bonneville Long Term Update and in our Forum), and I've since put together these Tips on How to Deal With a Flat Tire-- which covers everything from bike control to flat repair. Check out my article (as well as this piece on tire maintenance), and if you've ever suffered a flat yourself, I encourage you to share your story here. Have You Ever Experienced a Flat Tire? Kawasaki W800 – Updating the Retro Standard: "
Original article from: TheKneeslider.com - Kawasaki has updated the W650 retro standard with more displacement and a refined style but it's only available in Japan, so far, and based on the W650's poor sales when it was available in the US in 1999 and 2000, the new version may not make it here at all. [...]"
Motorcycles (albeit an electric) showing up in a gadget blog...the world as we know it has come to an end. Mission R electric sportbike drops its fairings, shows us its billet birthday suit: "
141 horses is a good amount of power for an average sized car. 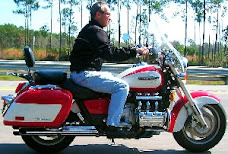 On a motorcycle that equates to one heck of a ride. That's what the Mission Motors Mission R electric superbike is putting down in a package that's the size of a 600cc road bike -- the sort of bike that might match that rating but only when you ride it like you stole it. An electric bike, naturally, gives you all that power right from 0 RPM, and after first seeing it in the flesh back in December we're now getting a glimpse under the fairing, at the trellis frame that bolts to the MissionEVT drivetrain ahead of the swingarm. There's naturally a big hole ahead of that, where the battery slots. The aluminum plate you see is part of that, left in place here but normally yanked from the top with the rest of the cell pack. Lots more tech details like that on the other end of the source link, and a bunch more pictures over at Autoblog Green. As to when you can get one, sadly right now it's just for racing. 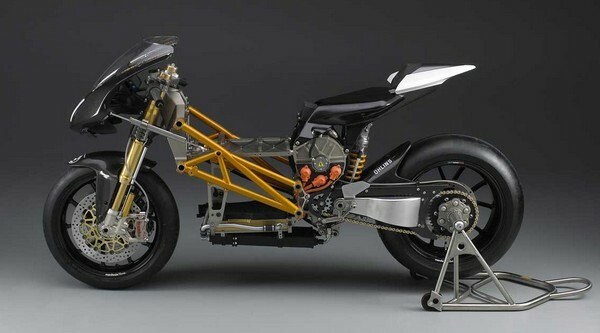 Mission R electric sportbike drops its fairings, shows us its billet birthday suit originally appeared on Engadget on Wed, 26 Jan 2011 21:05:00 EDT. Please see our terms for use of feeds. Permalink Autoblog Green | Mission Motors: Blog | Email this | Comments"
Steam-Powered Racer to Make Run at Land-Speed Record: "A team hopes its upcoming record attempt on the Bonneville Salt Flats will highlight an overlooked propulsion system." The Italian motorcycle manufacturer appeared to roar its way through the tough economic times with Ducati North America announcing a tremendous close to 2010, posting retail gains of 35 percent in December over the same period in 2009. Male Mid-Life Crisis Leads to Increase in Adventure Tourer Bikes, Reveals Swinton Bikes: "
You Know Those Beaded Taxi Seats? Well....: "
Here is the motorcycle jacket you have been waiting for. Finally! Now you too can pretend to be a New York cabbie driver on your motorcycle. This German jacket, from IXS, has beads in the back that will massage you while you mow down pedestrians..... fun! Grandmother Trades Husband In For Motorcycle: "
Great-grandmother of 2, divorces her husband of 30 years, buys a motorcycle, and heads for the road. Who ever said life stopped when you retire? You have got to watch this!! Want to meet a bunch of random strangers everywhere you go? Start riding around on a neon green electric bicycle that looks like nothing this world has seen before, something tossed out of a passing UFO that some New Zealand shepherd found glowing slightly as it rested in the middle of a smoking crater. This $3,595 electric bicycle with a 15mph top speed and six mile range does come from New Zealand, but the YikeBike is very much a product of human ingenuity, or so creator Grant Ryan claims, but that doesn't stop it from giving us a riding experience that is nothing short of other-worldly. Unfortunately, that doesn't necessarily equate to a entirely perfect experience. 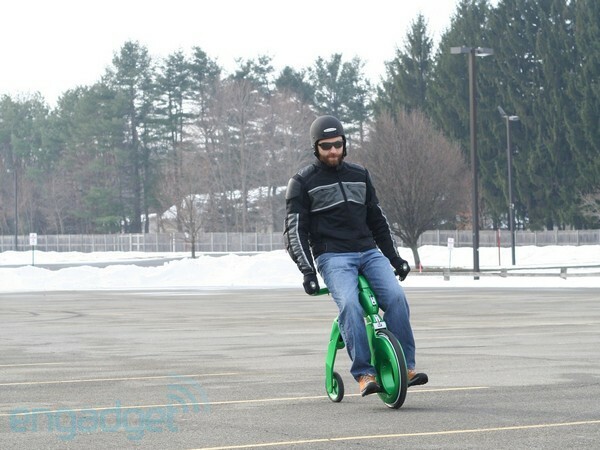 YikeBike review originally appeared on Engadget on Tue, 18 Jan 2011 12:02:00 EDT. Please see our terms for use of feeds. Permalink | | Email this | Comments"
Ladies: How To Get Your Men To Vacuum Clean: "
If your better half hates vacuum cleaning the house, here's one way to 'promote' vacuum cleaning...dress it up as a motorcycle. What To Do With A Spare Ducati Motorcycle: "
This is a problem we all have faced at one stage or another in our lives (more likely in our dreams)... what do you do if you have a few Ducati motorcycles too many? Pierre Terblanche joins Norton: "
He of the Ducati Supermono, Pierre Terblanche , has signed on with the reborn Norton Motorcycles. State law sends new motorcyclists to classroom: "
The state is inching closer to improving the chances for motorcycle riders to pursue their love of the open road and make it a little bit safer.Beginning this year, all new motorcycle riders regardless of age must complete a motorcycle safety course before getting the license endorsement to .